Leotard / swimsuit / hydrasuit, with sportback, cut: "stream acceleration ladies´ high-cut, cut tall". The lengthwise embossed fabric enhances the water stream. The swimsuit is FINA approved. Mizuno Sonic Fit AC - a high quality racing fabric which is also FINA approved - has a fine and light gloss. The fabric is lengthwise embossed which enhances the water streaming. The fabric is opaque in all colors. Mizuno Sonic Fit AC - a high quality racing fabric - has a fine and light gloss. The fabric is opaque in all colors. The embossing along the fabric changes the water stream and increases the flow speed. Handwash only, please turn to left (table material inside) for washing, do not wash with others, because the color could rub off. When used as a regular swimsuit, you should always wash it right after use, to remove harmful salt and chlorine residues which might attack the surface material. 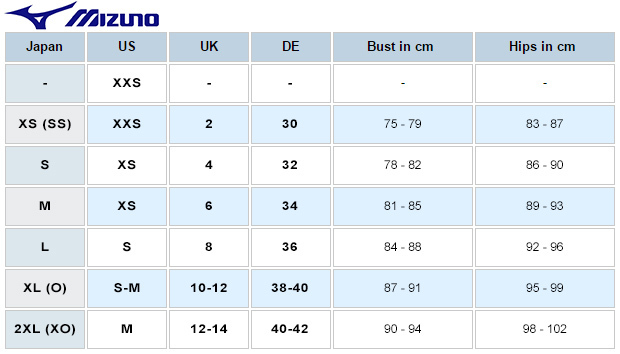 We don´t have any resell conditions from Mizuno products yet and import all swimsuits on costumer request directly from Japan. If you want to preorder a specific color and size, please get in contact with our service team. We check the availability of your desired item and come back to you in time. After your payment we order for you in Japan. Our product prices include already all European import taxes and custom fees, there are no hidden additonal costs at delivery for all customers in the EU. I hope you understand, that we cannot guarantee the current availability of all our pre-order items. We check the stock of our Japanese cooperation partners and get back to you as soon as possible. The shipment time is at approx 20 business days. N011 REALISE Hydrasuit classic black "Super Shiny Wet"